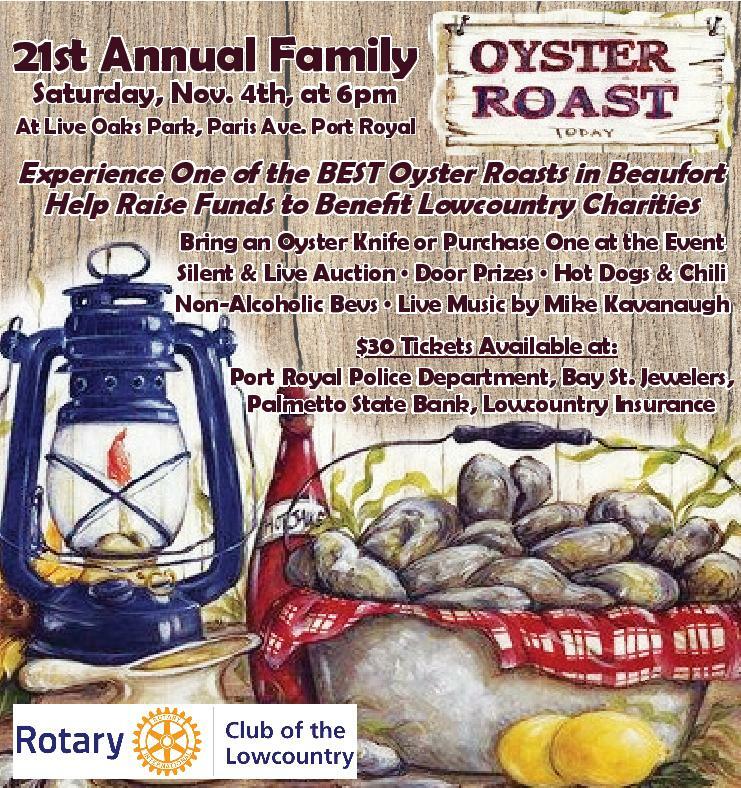 Saturday, November 4th, Rotary Club of the Lowcountry is hosting it's 21st Annual Family Oyster Roast in Port Royal's Live Oaks Park on Paris Avenue. Gates open at 6 pm. Tickets are $30 and include all you can eat oysters, hot dogs, chili, beer and non-alcoholic beverages. Children under 12 are free. There will be a live and silent auction with lots of door prizes to be awarded. Music will be provided by Mike Kavanaugh. Last year the event saw record attendance levels. Tickets can be purchased at Port Royal Police Department, Bay Street Jewelers, Palmetto State Bank and Lowcountry Insurance on Lady's Island. Tickets can also be purchased at the gate. All monies raised benefit charities that help our neighbors here in the Lowcountry. Rotary Club of the Lowcountry is all about neighbors helping neighbors. Come out and support our community and enjoy some of the first, freshest oysters from our wonderful friends at Sea Eagle Market.